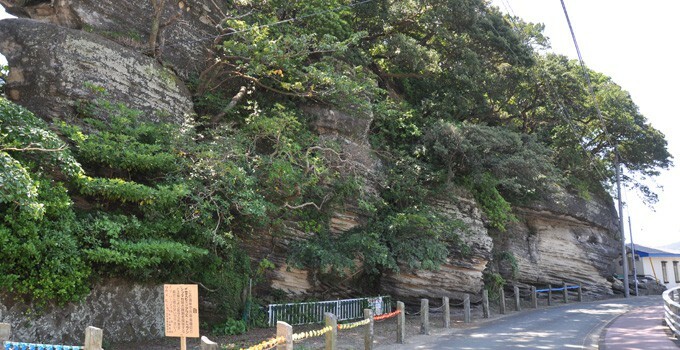 The Kakisaki Bentenjima is famous for a beautiful striped pattern of the soil strata. These strata were formed by ash and pumice stone emitted by a submarine volcano. The strata later accumulated on the ocean floor, and the striped pattern (cross lamina) is the effect of the ocean currents. On the surface of these strata one can observe the so-called ‘trace fossils’ (fossils with marks left by shellfish and other living things: these can be holes dug out by these creatures or the paths they left as they crawled on the bottom of the sea). Kakizaki Bentenjima is also famous in history as the place from where a leader called Shoin Yoshida rowed to one of the Black Ships of Commodore Matthew Perry.